3 Weeks of Diet Coke! Only 9 more days to go! I wish I had a picture of the 7 vials – SEVEN! – of my blood that the blood test lab drew on the day before I began drinking 10 Diet Cokes a day, but I was dizzy and queasy and tired after the day of testing and the blood loss, and I completely forgot. I don’t like giving blood, but The Doctors TV show asked their doctor, Dr. Pinzone, an endocrinologist, to thoroughly examine me, before and after the test, to see what changes the 300 Diet Cokes caused to my health. And those results are now looking like the only real chance we now have to determine how bad, or not bad, drinking Diet Coke REALLY is. Because I’m not showing any of the health problems that I had when I drank regular Cokes. My body weight is the same – within a pound or 2 of where I started – and I haven’t noticed real changes to my fasting blood sugar or blood pressure. More than that, I feel fine. 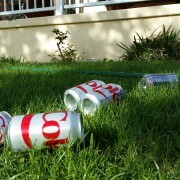 At the three week point in drinking regular Coke, I didn’t feel great. 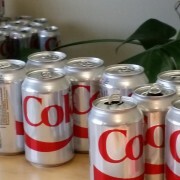 The biggest problem I have with the Diet Coke drinking is related to the sheer volume of liquid; I’m making a dozen trips to the bathroom while I sit in the office drinking diet soda all day. I think that if I was drinking caffeinated water (which you can buy, actually), I would feel the same. Caffeinated and needing to pee. But no one believes it. I’m still hearing from so many people who believe that Diet is worse for you than sugared soda. I was on a talk radio program the other day, following a doctor who was warning that diet sodas cause diabetes and weight gain, but as soon as said that he might be exaggerating the dangers, I was off the program. “Diet Coke is Bad For You” = interesting news. Sells toothpaste. “Diet Coke isn’t that Bad For You” – Boring. Turn the channel. Except for the millions of people dying from diseases related to high insulin, which is caused so dramatically more by sugar than artificial sweetener. It could be very damaging to dissuade people from switching from sugared soda to Diet because of exaggerated fears about the dangers of diet. So, it’s all coming down to the blood lab tests and Dr. Pinzone. Will he find changes in my blood labs that show Diet to be even worse than sugared soda? Nine more days, 90 more Diet Cokes. http://10cokesaday.com/wp-content/uploads/2015/04/2015-04-03-15.39.04.jpg 1080 1920 admin http://10cokesaday.com/wp-content/uploads/2015/06/Ten-Cokes-Logo-300x138.jpg admin2015-03-26 23:15:252015-04-17 23:14:283 Weeks of Diet Coke! Only 9 more days to go! Tomorrow I’m going to have to look for some Diet Cherry Coke or something to break the monotony. It seems like there’s always a long line of Diet Cokes ahead of me. Like that fairy tale about the porridge pot that keeps refilling itself as soon as its empty – until you say the magic word for STOP. But I can’t stop now. I’ve got about 10 more days to go. Only 100 more Diets to go, in a little more than a week. Ugh. Tired of drinking so much Diet Coke. It’s five o’clock and I’m choking down #10. A full day’s work. On the other hand, my health still seems to be under control. Saw a minor weight gain over the weekend of two pounds, but that’s probably a normal variation for me, and also maybe related to eating a bunch of Mexican food, margaritas, and breaded seafood. We’ll see tomorrow, when the first three weeks are completed. While I’ve been trying to weigh all the sketchy evidence about the dangers of diet soda, I found this statement from the Center for Science in the Public Interest. The CSPI has been crusading for better nutrition and food safety for 40 years. Intriguing findings in a paper published in Nature raise serious questions about the effect of saccharin and possibly other artificial sweeteners on the microbial world inside our digestive tracts and the resulting impact on blood sugar and metabolism. What these chemicals do in our gut deserves further study. But consumers already have ample reason to avoid saccharin and aspartame, and reason to be cautious about sucralose, primarily because of evidence from animal studies that they may cause cancer. However, it would be a mistake to conclude that diet sodas are worse than drinks sweetened with sugar or high-fructose corn syrup, and no diet-soda drinker should interpret the new study as license to switch to regular soda. The study does not overturn the best studies that show that people who drink diet soda don’t have a higher risk of type 2 diabetes (unlike people who drink regular soda), and that people are more likely to gain weight on sugar-sweetened than diet beverages. These risks from sugar drinks far out-weigh the new concerns raised today about artificial sweeteners. Three more diet Cokes to go today. Whatever – it’s still early afternoon. 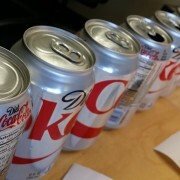 I start the day with ten cans lined up across the desk and just work my way through. Took my blood pressure in the morning, and then again this afternoon, and in spike of the 7 Diet Cokes, it is only marginally higher. 127/79 this morning, and 130/83 at 2 pm. And my BP is typically higher in the afternoon than morning, so the rise doesn’t mean much. I’m just glad it’s down in a reasonable range. The excellent doctor who examined me before the experiment and will examine me afterwards, and look at the results of our blood tests, also wanted me to make sure and take my BP readings at the same time all day, so I’m measuring in the a.m.
Caffeine and dehydration haven’t been bothering me as much in the office this week. Okay, I drank 70 Diet Cokes this last week. And I feel good. I do go to the bathroom a lot, but the exercise is probably good for me. Okay, it’s a bit irritating, like a job to do, drinking 10 Diets, but it’s easier than digging ditches. My weight is steady, at 168 lbs. I’m assuming my body fat hasn’t moved much either, staying around 10%. 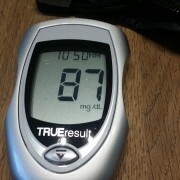 My fasting blood sugar, measured in the morning, also seems steady around 80 mg/dL. 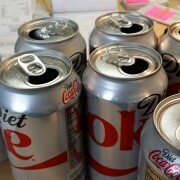 Compared to drinking the regular sugared Cokes, drinking Diet Coke is easy. I’m not experiencing the feeling of fullness that I had when I drank the sugared Coke. I also feel that my energy levels are much steadier, and I don’t have the tiredness and carb cravings in the day as when I drank 10 regular Cokes. On the other hand, the caffeine is really bothering me. Turns out Diet Coke has 10 mg more of caffeine than regular Coke. 42 mg vs 32 mg. But, still it’s only 420 mg of caffeine a day, and depending on the size of the coffees you drink, that could easily be only three or four cups of coffee. I normally drink 4 espressos a day, which actually have less caffeine than regular coffee, but I am still surprised that I’m getting so jittery and dehydrated drinking the Diet Cokes. The first few days last week I was still drinking Diets late in the afternoon, and I had trouble sleeping later. Dehydrated, too. I worked outdoors at a trade show last week, and between the constant trips to the bathroom, the jitters, and dehydration, I didn’t love the experience. Back in the office now, however, I’m not feeling the dehydration as much, just enough to keep the Diet drinking going, and the bathroom is closer. I’m maintaining my normal diet, which is generally low-carb, although I did have a couple pretty carby dinners in Nashville last week. Still, that behavior is basically in line with what I consider to be healthy eating; I ate just protein, eggs and sausage, at the hotel for breakfast, and had bunless hot dogs or sausage for lunch. So, outwardly, not much is changing. I think by this time in the first Cokes experiment I had gained 6 pounds or so. That’s not happening now. But inwardly? Don’t know. I feel good. I gave seven vials of blood for the blood analysis that The Doctors TV Show gave me before I started. We’ll do the same tests after 30 days and see what’s happened inside. A good friend on Facebook suggested that the Diet Cokes is actually worse for you than the regular Cokes, and I have to confess that, going into this experiment, I don’t agree. I believe that the health problems caused by high insulin levels due to sugar and carb intake are much, much more dangerous than even a chemical-filled menace like Diet Coke. Is water better than Diet Coke? Yes, probably, sure. But if the choice is between Diet and sugar – a billion dollars a minute in U.S. health care costs says that high insulin is very destructive, and Diet Coke doesn’t cause as much, if any, elevated insulin as regular Coke. Of course there may be other issues, but I would say an unknown possibility far down the road wins over a known, and sure, damage to health right now. So, here I go, into Week II. Two more Diet Cokes today, and it’s four o’clock. I have to get to work. 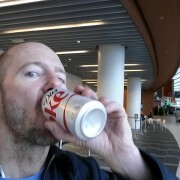 Today was the first day of 10 Diet Cokes a day, and it was tough start – partly because I’m in Nashville setting up a trade show for business, so I woke up in a hotel and couldn’t get my hands on a Diet Coke until I got to the Nashville Music City Center, where Diet Cokes were $3 a piece. Drank two there in the morning, and then made it out to a Walmart to buy a case and drank the rest throughout the rest of the day – out in the freezing rain, while setting up our outdoor booth. Rough. Another thing was that the caffeine content of the Diet Cokes seems much stronger than in the regular Cokes. Have to look it up, but every time I drank a Diet Coke I got a definite caffeine buzz, and now, at 10:30 at night back in the hotel, I’m still wired and not ready to sleep, even though we have to be up early for the Expo. On the other hand, actually drinking the Diet Cokes is much easier than drinking the regular Cokes. No feeling of sluggishness from the blood sugar peaks and valleys, no feeling of fullness; they go down pretty easy. No changes in weight or blood pressure yet, and we’ll have a look at blood glucose in the a.m. Tomorrow I’ll be outside all day in 25 degrees F and 6 inches of snow, chugging Diet Cokes. Should be fun. And buzzy. Hope I don’t get too addicted to the caffeine. Maybe I’ll write a novel. Like right now. Before bed. I’m going to do another little experiment. I’m going to drink ten DIET Cokes a day for 30 days and see how it affects my health. This time it the experiment seems a bit more dangerous, since Internet searches for big Diet Coke drinkers turn up a few people who have actually died from massive Diet Coke consumption. Hmm. Maybe. I’d want to know what other health issues the dead people had. But, let’s not get bogged down on the danger of death; I’m doing this for Science. I’m doing it to advance human knowledge. I’m also doing it because it was the top question I received after doing my first experiment, where I drank regular sugared Coke for a month: “What would happen if they had been Diet? Would you still have gained so much weight?” Regular readers of this blog will remember that I gained 23 pounds in 30 days. Well, I doubt that I’ll gain that much weight. There just won’t be enough increase in my insulin levels to force my body to store that much fat from my normal diet. But, there are studies that show that drinking artificially sweetened sodas can still cause weight gain, and also that diet soda drinkers still have higher body weights, more Type II diabetes, and more heart disease. And there are other potential health problems. So, what will I be looking for in this Diet Coke experiment? 1. Possible weight gain – or loss. When I drank 300 sugared Cokes, I gained 23 pounds. I don’t expect to see that weight gain again, but it is possible that I gain weight because of several of the points below. Or I could lose weight. Here’s the interesting thing: studies show that people who drink diet soda are heavier, have more heart disease, and more diabetes, than regular soda drinkers. But, also, people with health problems or weight issues are more likely to choose to drink diet sodas. So, the effect is not causal. 2. Metabolic confusion – does the body react to diet with any insulin spike, causing weight gain? Some science suggests that because the sweetness of the diet soda tells the body that calories have been ingested, the pancreas releases insulin, which would potentially cause weight gain just as when drinking sugared sodas. But how much insulin? How much weight gain? Or loss? 3. Will the sugar cause hunger and increased eating, or will I avoid hunger by avoiding insulin spikes? Will the sweetness of the diet soda satisfy my appetite, or will it make me hungry for more carbs, as eating real carbs does? 4. A false feeling of healthy eating allowing junk food eating. There is a syndrome called “Diet Coke and Big Mac and Fries.” Basically, the dieter feels free to eat other junk food because they are eating “healthy” by having the Diet Coke. Resulting in eating lots of carbs, having high insulin, and gaining weight. 5. Calcium. Diet Coke is rich in phosphorus, which can deplete bones of calcium. How much of a problem could that be for me in 30 days? With 300 Diet Cokes? 6. Caffeine. 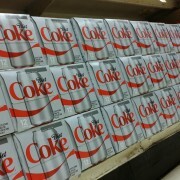 There’s a lot of caffeine in Diet Coke. And I’m drinking 10 a day. I do normally drink coffee. (Which I reduce or quit during this experiment.) Also, I didn’t notice major problems with the caffeine when I drank regular Cokes – as long as I finished drinking the Cokes before dinner, or else I would have problems falling asleep. But it could be that Diet Coke has more caffeine, or that the lack of sugar causes a stronger reaction. 7. Asparatame issues. I haven’t noticed any problems or reactions to drinking aspartame-sweetened diet beverages in the past, but this is a lot of diet soda to drink in one month, so it may be enough to cause issues. Although most studies show no problems related to ingesting aspartame, some people do have aspartame sensitivity, which can cause lethargy, headaches, and other ailments. And I’ll be consuming a lot of aspartame. 8. Other changes to my health and body chemistry. 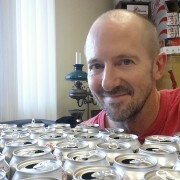 I’m having a complete blood workup and physical exam with The Doctors TV Show before I begin drinking 10 Diet Cokes a day, and then I’ll get another blood test and physical when I’m done, so we can see exactly what changes or problems have occurred by drinking 300 Diet Cokes in a month. You should see the amount of blood I gave for the tests yesterday: 7 vials of blood. 9. Changes to the flora and fauna of my gut. Good recent studies indicate that drinking diet soda cause changes to the human gut that may cause weight gain, among other things, and our knowledge of our gut bacteria is in its infancy. So, a lot of pretty intriguing things to learn by this experiment. If you drink 10 Diet Cokes a day, you’ll want to follow along. I’ll be taking my blood pressure, body fat, body weight, and fasting blood glucose levels every day, and video blogging about how I feel. I am so excited to see what happens. It’s funny: On the one hand, I really hope to see some dramatic results from the experiment that further our knowledge about how our bodies work and how how we are affected by drinking diet soda. On the other hand, I really just hoDpe that nothing bad happens to me. That said, let’s go. I start drinking 10 Diet Cokes a day in the morning.